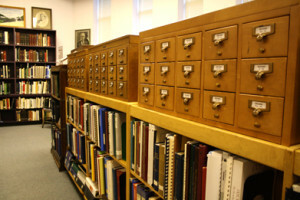 Many of the Pennsylvania Room’s materials can be found in the library’s catalog. Visit the Online Catalog and try searching for your topic of interest (ex. “Smith family” or “iron furnaces”). Arrive with your prior research organized and with specific questions to answer. This can help you make the most of your time in the room. But if you’re not sure where to start, or what question to ask . . . that’s all right! We’re here to help. You are welcome to call, email, or use the contact form below to discuss your visit and topic of research. If we do not have the information you are seeking, we might be able to direct you to an organization or individual who can help you. Ahead of your visit, call the Library at (724) 437-1165 to make certain that the room will be open and staffed. The room may also be closed as needed when the curator is attending meetings or events. If you are traveling a long distance to visit us, please call ahead to make sure that the room will be open and staffed. Those who have a Uniontown Public Library card, a Washington & Greene Greater Information Network (WAGGIN) card, or an Access PA library card from elsewhere in the state have free access to the Pennsylvania Room. Likewise, students of Fayette County schools may use the room for free. If you are from out of state and/or do not possess a card from a participating library, a $5.00 donation is appreciated for use of the Pennsylvania Room. This donation covers all members of your group. Additional costs to consider are the copying machine fee (20 cents/page) and the microfilm printer fee (50 cents/page). For directions, please visit our Contact Us page. The Pennsylvania Room is located on the library’s second floor. If you’re thinking of stopping by, drop us a line to let us know what you’re looking for. Thank you for your interest in the Pennsylvania Room!